Today’s story comes from my friend Leslie. She and her sister were our childhood neighbors and have been lifelong friends of ours. Thinking back about all those days we played together, none of us could predict the paths our lives would take. Leslie’s story is a story of God’s miraculous hand orchestrating His will over a situation that seemed impossible. I stand amazed at the strength and beauty she possesses in retelling the life-changing events that happened with the birth of her son, Jameson. A true beauty for ashes story (Isaiah 61:3)…. When I was 9 weeks pregnant I heard the heartbeat of my second child. It was a wonderful feeling, but it only lasted a few weeks. On my next appointment, I had a second ultrasound to check a cyst on my left ovary. The doctor became very quiet and finally told me that my baby had an abdominal wall defect and he wasn’t sure how involved it was. He couldn’t tell me if my baby would survive and he made an appointment for me to see a specialist called a perinatalologist. I drove home from the appointment sobbing and met my husband in the driveway. We cried and tried to make sense of the situation. I researched all the possibilities and I remember being relieved that he didn’t have the worst of these defects, which was Pentalogy of Cantrell. Two agonizing weeks later I met with the specialist. He was about two hours behind schedule. I waited for my husband to meet me hoping that my case was misdiagnosed. Instead, the doctor told me that my baby had an abdominal wall defect called an omphalocele. The O contained his liver and intestines and the bottom part of his heart. He also told me that some of his sternum was missing. He couldn’t give me any hope, but he did offer an amnio and told me that termination was an option. He also told us that the baby was a boy. Even though I was devastated I tried to make the best of the situation. I started praying, and learning to trust God in a way I had never experienced. I felt like I had to give my growing baby to God. That he wasn’t really mine to keep. I knew God was working in my life, but I didn’t understand why it had to be this way. From there I researched doctors and tried to find the best doctor in Arkansas. I came across Paul Wendell, who I started seeing at 18 weeks gestation. He told me there was basically no chance of survival in this type of case and he sent me to more specialists, a cardiologist and a neonatologist. At 20 weeks, our baby was diagnosed with Pentalogy of Cantrell. This was the condition that I had seen during my research. I knew what it was. The cardiologist told me this was fatal. Despite the bleak outlook I tried to learn from the situation. Everyday was a battle in my mind. I knew I had to keep going so I continued working as a kindergarten teacher and raising my 20 month old daughter. It was a struggle to say the least, with some days beginning in tears. I felt like I was on a good path and all of it was taken from me in an instant. Nothing seemed right. One afternoon while shopping with my daughter a man approached me and told me that I would need a double stroller soon. I broke down. It wasn’t the first or last time. I remember receiving a baby blanket at work and I had to leave my class. I didn’t purchase any items for the baby. I did have to ask my mother in law to buy an outfit for his burial. I could barely make the words pass through my lips. I knew I wasn’t strong enough to go into the store. It was too much to handle. My belly grew and we named the baby Jameson. I felt Jameson move everyday. I talked to him and prayed for him and loved him more with each day. Towards the end of the pregnancy my husband and I began to look for burial plots. We found a peaceful place beside my grandparents. It was beyond hard. The casket was tiny and white. I couldn’t imagine leaving my baby, someone taking him from me hours after birth. I hated it. I remember one night it stormed and all I could think was that he would be out there all alone in that tiny casket so far from my arms. It was hard to understand God’s purpose with my tiny baby. All I knew for sure was that I wanted Jameson to know that I loved him, even if it was only for five seconds. I wanted to hold him and touch his skin to my skin and kiss his tiny head. I asked God to take him quickly. I didn’t want him to suffer. I went into labor on June 27, 2012 and delivered Jameson via Vbac at six am. He weighed eight pounds even and he let out a small cry. Even though the doctors told us things looked extremely grim we decided to have him taken to Arkansas Children’s Hospital for an evaluation. I held him and kissed him before he left. I felt very peaceful after the birth. Kyle left and met Jameson’s doctor for his NICU team that day. He immediately made us feel more comfortable. He gave us hope that we could take it day by day. I left the hospital a few hours later and went straight to the NICU. He had a room by himself for a few days so we got to spend some alone time with him. One of his doctors later told me that she didn’t think he would even make it through that first night. I was unable to hold him, but I prayed for him and asked everyone I knew to do the same. He did make it through that first night and after about a week he started taking my breast milk via tube feedings. We also got to hold him. He grew stronger each day, but his heart wasn’t keeping up. He continued to have desaturations and turn blue. He needed his heart repaired. This was something the doctors had hoped to put off until his omphalocele was more stable but on October 2 we planned to have his open heart surgery. Unfortunately, someone needed a total heart transplant on the same day and our surgery got cancelled. We ended up having the repair on October 6th. I remember pushing him back into the surgery room and knowing that this might be the end for us. I prayed a lot during those first few months and sometimes I heard no reply. I wanted God to tell me why he would put my child through so much. Why was he allowing him to suffer? As a mother I felt responsible. After the heart surgery things didn’t get better. Jameson was still having desaturations and turning completely blue. One day I walked up to a team of doctors around him with a crash cart out. This was around the time the doctors told me things weren’t getting better because Jameson had tracheal and bronchial malacia and that he would need a tracheostomy and a ventilator until he was stronger. I had a lot of questions for the doctors. My number one concern was what would his quality of life be? How long would he need a ventilator? Would he have to live in a facility if I died. I was once again faced with the question…. do I discontinue care and hold my child as his life ends or do I go forward with yet another surgery? Jameson was four months old, he liked to snuggle, he loved reading books, and he loved being rocked. I couldn’t imagine letting go of my child, but I was prepared to if it was the best thing for him. I hated being faced with these decisions. My life was so easy before. I didn’t know this side of life existed. I was surrounded by sick children everyday. I saw them struggle. Most of them were alone with no one by their side except a nurse. Their parents had to go back to work, or had other children, or lived far away. What upset me the most was the children who were abandoned in foster care and struggling. I questioned God. Why? I had a lot on my mind, I never got to rest, and my time was split between my very sick baby and my two year old. I prayed and called my counselor. I feel that God provided me this woman. She had life experiences that helped me to deal with my current circumstances. I told her I felt like the struggle was my fault and that Jameson was here and struggling because of me. I didn’t want to put him through a hard life. I said, Jameson won’t be able to eat, or talk, while he has this machine. She looked at me and said “But Leslie, one day he will walk, he will see, he will hear, he will touch. Think of all of the things he can do and not of all of the things he can’t do.” She looked at me and told me that I wasn’t keeping Jameson alive. I wasn’t in control. She said God could take him right now if he wanted to, but he hasn’t because he is here for a reason. Wow. This made sense to me. She said “these thoughts that you are responsible for his suffering, or that you are the one here keeping him alive… these are not from God.” Wow. We made the decision to get Jameson a tracheotomy in November. The NICU team believed that Jameson would progress and go on to live a fairly “normal” life. They strongly urged us to go forward. Jameson had g tube placed, a trach, and diaphragmatic hernia repair. One week later it was Thanksgiving day and he was stable enough for us to hold him for the first time since his surgery. He looked up at Kyle and I and smiled. This was the first time I had seen his whole face – his face without any tubes or tape. It was precious and wonderful. I prayed that he would get to come home soon. The days and weeks rolled by and he became stronger and stronger. 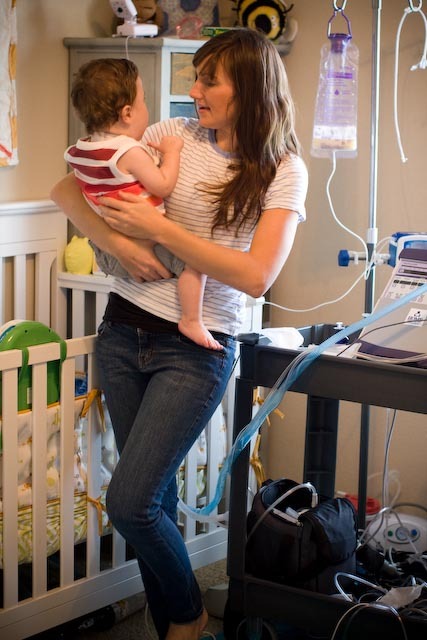 The pulmanolgist estimated that he would be off of the ventilator by age two. We struggled a lot with tiny milestones, but I stayed focused on moving forward and we did. 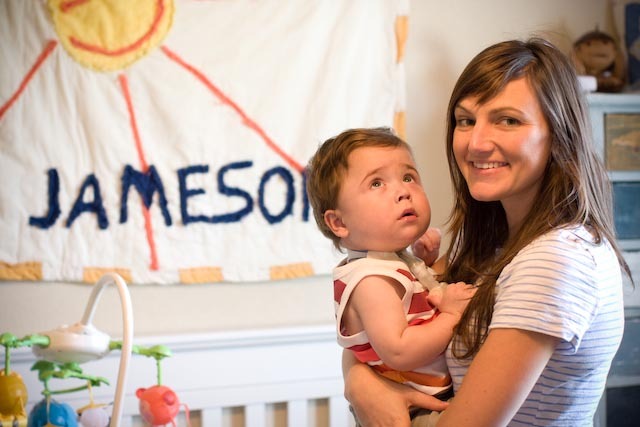 On May 13, 2013, 10 months and 16 days after birth, Jameson came home for the first time. He just celebrated his first birthday. He is healthy and strong. He brings joy to everyone around him. My life is full of challenges now, but I believe this is God’s path for my life and I gladly accept it. I now spend my days taking care of Jameson, who is on a ventilator and oxygen, and my daughter who is three. Although it is hard I feel that God has given me grace. He has provided for me and my family. Jameson is a happy guy and is developing new skills every day. I don’t compare him to other children. He’s special to me and brings joy to our lives. I think about my friends with children still at Arkansas Children’s Hospital. Some of them have never gone home and some of them never will. Many of the moms I became close to lost their children. I’m not sure why. I’ve learned not to question too much. I don’t know why this happened to us, or why children suffer, or why some people never get the miracle they are praying for. All I do know is God has given me peace, he has provided for my family, he loves us and I believe he has a plan that is much much bigger than our plan. We just have to trust him and go where he leads. So these days I try to focus my attention on being the best momma I can be to my children and the best wife I can be to my husband. I finally realize that its not all about me. I see others suffering and I want to be the hands and feet. I want to go where God leads. I’m not guaranteed a lifetime with my children so I try to make our lives count – have fun, not worry too much, and let go – really let go – and trust in what God has planned. It turns out, this path is way more difficult than the one I had planned for, but its also rewarding in ways I thought impossible. This is my path, a path that God gave me. I am his servant. 09 Sep	This entry was published on September 9, 2013 at 1:58 pm. It’s filed under My Story and tagged devotionals for women, encouragement for women, miracle, omphalocele, Pentalogy of Cantrell, special needs children, strength and beauty, WhoIsBeautiful. Bookmark the permalink. Follow any comments here with the RSS feed for this post. I still remember your wedding day & the beautiful act of the “foot washing” that y’all did. Was that a sign of what was to come, we’ll never know this till we see JESUS! Jameson is GOD’S miracle to show the world His power. Thank God, you & Kyle didn’t give up & listen to the people who said to abort your beautiful Jameson! God Bless you & Kyle! Thank you Janis. He is a miracle to me. I’ve learned so much from this situation. It is hard but the love I have for Jameson over powers the hard times. Lameta what would I do without Hannah? She is so special to us. She has helped me so much this year. I’m so glad God brought her into our lives. WOW, Leslie! I am crying reading this amazing story. I know God only gives us what we can handle and you have handled your situation with grace and strength. I am totally amazed. What an honor it is to be Jameson’s mommy. I am so proud of you and so happy for you. You are truly an inspiration and a true example of what a true Christian should be. Thank you for sharing you story. I pray that God continues to bless you and your sweet family. Leslie, what a beautiful family you have. Reading this brought tears to my eyes but you are obviously a strong person. I admire your faith and strength.